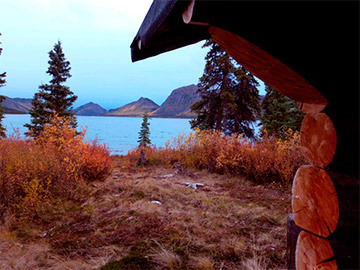 Our wilderness cabins are nicely located on a peninsula at secluded Dalayee Lake, nestled in the rolling hills of southern Yukon. This crystal clear lake lies at an elevation of about 970 meters / 3200 feet and is surrounded by mountains peaking up to 1450 meters / 4700 feet. The lake borders the proposed Agay Mene Natural Environment Park, which protects the region from further development. Accessible by floatplane or overland trail, the rustic log cabins offer a true respite from the stresses of modern-day life. This is an awesome place to explore and relax in the solitude of an unparalleled natural setting. Since nobody else is around you may quickly feel like this is your lake only! There are two log cabins available. The two story LYNX is the one we rent in the first place, offering room for four to five people. On the main floor you will find a sofa, table with chairs and a kitchenette equipped with everything you need for your cabin adventure. The upper floor has one queen size bed, a bunk bed, an additional sofa and also boasts a veranda. GRIZZLY cabin. With its rough log work from the 60ies and the crooked floor boards it gives you that distinct trapper feel. On the main floor you’ll find a table with chairs and a small kitchenette. Above is a loft with two queen size futon beds. This cabin is currently not available. A cozy wood fired SAUNA is available for all guests. There is no electricity and no phone service on the property. Dalayee Lake lies in the boreal forest. Stroll through typical white spruce, pine and alpine fir forest or climb onto the surrounding plateaus. 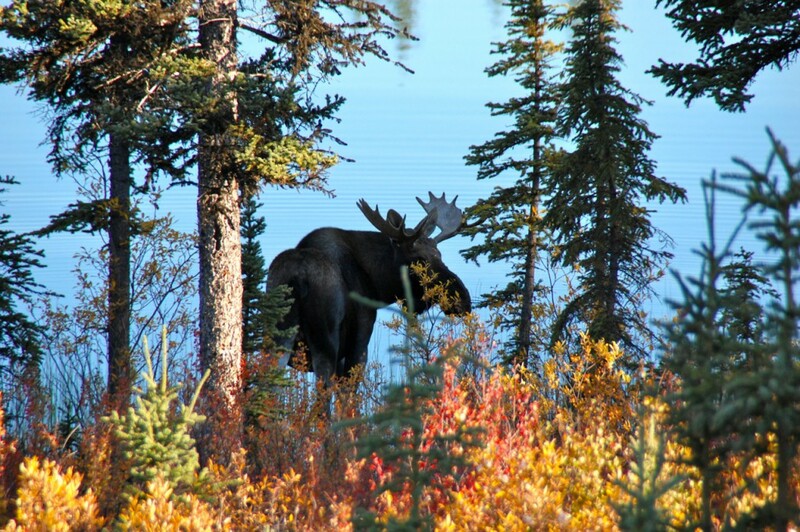 Look for signs of passing moose, lynx and snowshoe hare. Enjoy the sight of the plentiful waterfowl and listen to the whiskey-jacks and chickadees. Paddle out on the turquoise water of the lake and, in fall, marvel at the changing colors of the birches, aspen and willows. 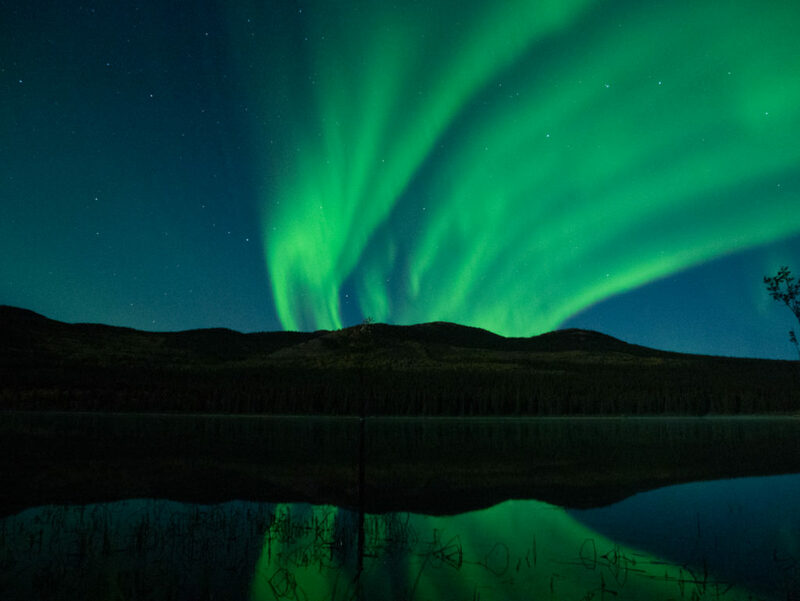 Gaze at the stars and, with a bit of luck, you may see the amazing northern lights dancing across the sky. 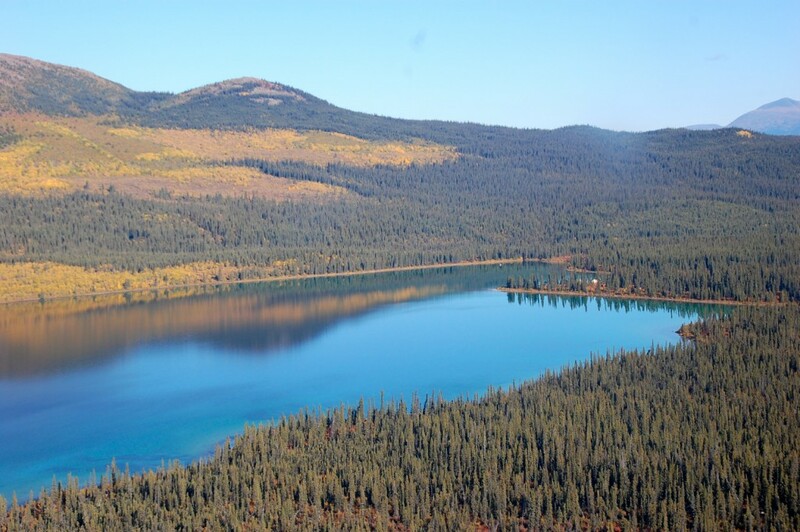 Dalayee Lake lies – as the crow flies – 85 km / 55 miles southeast of Whitehorse. Flying in by floatplane gives you a great birds-eye view of the region and is a choice you will not regret. On the road it is 110km / 70 miles to the trail head near Squanga Lake. From there you can hike or bike the 9 km / 5.5 miles to the cabins. The rough and in some places swampy trail follows a gentle slope through boreal forests. Elevation gain is approximately 200 meters / 650 feet. 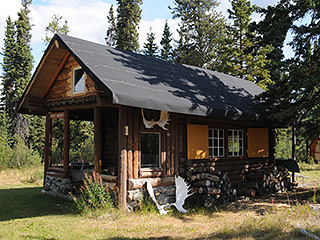 Cabin rental, Sauna, firewood and propane, kitchenette with utensils and dishes (bring your own food). You will also like the outdoor fireplace and the propane BBQ. Two canoes with life vests and paddles are included with the rental. Water is hauled from the pristine lake which is part of the simple lifestyle this place has to offer. A clean outhouse is just a few steps away. The beds have comfortable mattresses, however we recommend you bring a light sleeping bag with you. Although there is room for up to 8 guests in our two cabins, we will rent to only one party at a time. This ensures that guests get the unspoiled wilderness experience they are looking for. Road transfer to the trail head, up to 4 guests is $250.00 + GST, one-way.